Head coach Mike Lonergan led the Colonials to their first ever NIT win on Tuesday night, defeating Pitt 60-54. Two basketball teams play a game. One shoots 34.4 percent from the field and pulls down 35 rebounds, the other shoots 48.9 and pulls down 41. The first team has 10 of 21 baskets assisted and missed 14 free throws, the second team has 17 of 22 baskets assisted and missed 10. Well, most of the time it would probably be the second team. But on Tuesday evening in Pittsburgh, a normally hostile environment, GW found a way to win, topping Pitt 60-54 to advance to the second round of the National Invitation Tournament, despite coming up short in those categories. They won on the gutsy plays, on the 14 offensive rebounds to Pitt’s six and with crystalline ball handling. “We want to win this NIT and go as far as we can, but tonight should prove to these guys that even when you’re not shooting well, 34 percent, if you play defense and rebound like we’re capable of playing, you can beat anybody,” head coach Mike Lonergan said. Defense was apparent as the Steel City became steal city Tuesday night. The Colonials swiped the ball 10 times from the Panthers, four winding up in the clutches of Atlantic 10 all-defensive pick Patricio Garino. It was a vintage performance for the junior swingman who, despite being known for his ball hawkishness, has had some off games on defense and games when his own turnovers were a cut to the jugular for GW. But there were no such problems Tuesday: The Colonials coughed up the ball just four times, helping them outscore the Panthers – an ACC team that beat Notre Dame and UNC earlier this season – 20-8 off turnovers and 12-4 off the fast break. The turnovers and offensive rebounding helped GW take 16 more shots than Pitt, which made up for the chasm in shooting percentage. 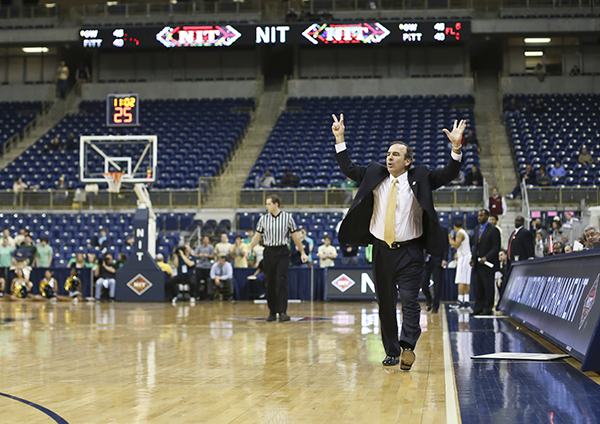 The Colonials were 21-61, while Pitt had just one more make from the field at 22-45. The rest of the game was won at the free-throw line, strange to say given GW’s 50 percent mark from the stripe. Still, the Colonials bested Pitt’s 44.4 percent and took 28 shots to Pitt’s 18. Joe McDonald was the only player to make more than two free throws while shooting over 50 percent from the stripe, where he went 5-8. He was, in many ways, the poster child for the win: 1-8 from the field, 0-3 on three-point attempts, but all over the stat sheet in other ways. McDonald pulled down seven rebounds, second only on the team to Kevin Larsen’s nine, with three of them off the offensive glass. Two of his offensive rebounds came with less than four minutes to play in the game. Ahead by just four, McDonald saved the bounce from a missed free throw by Savage and drew a foul. He increased GW’s small lead from four to five with a 1-2 mark from the stripe. That’s statistically bad, but it made for a true two-possession game. Pitt got a shot off, but missed. Savage drew a foul on the next possession, but missed his first of a one-and-one opportunity. McDonald again, though, got the offensive rebound. Savage missed on the next play and Pitt got an offensive board of its own, but McDonald then stole the ball. By the time Pitt finally made a shot and cut the lead to three, McDonald’s work had helped the Colonials burn more than a minute of the clock. He then drew a foul and hit two clutch free throws to regain the five-point lead with 2:18 to play. He hit two more with 22 seconds left. It’s not ideal to shoot less than 40 percent from the field in a single-elimination format national tournament game. But sometimes it happens, and sometimes teams go far in the postseason by winning ugly with the in-between plays.